We are grateful to Dr. Vidar Poulsson for his assistance in preparing this catalogue entry. 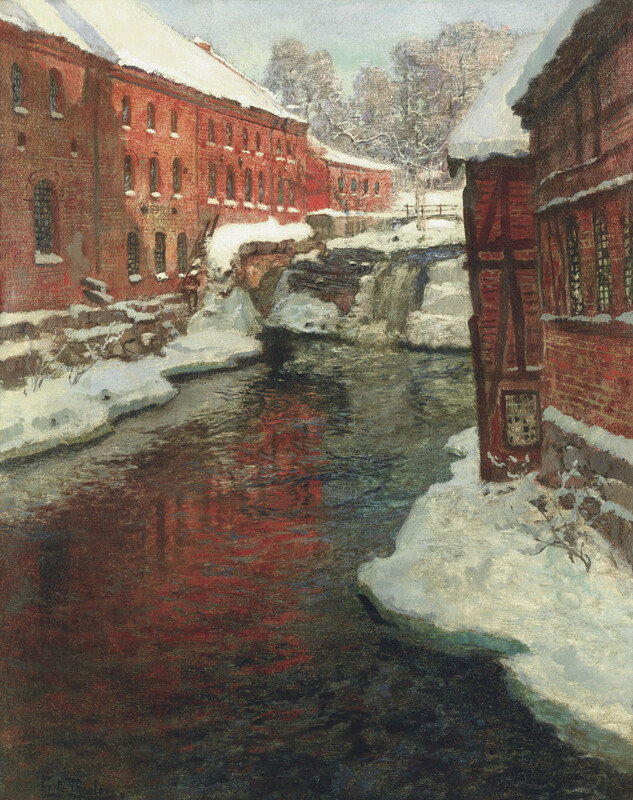 Frits Thaulow was tirelessly attracted to the Norwegian winter landscape and returned to paint snow-covered cities, fields, trees and tracks time and again, masterfully depicting the ice, the snow and the naked nature. While his choice of location frequently varied, his love for the cool beauty and serenity of Norwegian winters remained a constant. Indeed, he was less interested in providing a faithful depiction of a given spot than he was interested in obtaining an honest account of a season. The present picture takes its subject from the Aker River, but its composition is most likely subjectively arranged, as an exact spot along the river for the subject cannot be determined. There exist approximately six versions of this subject, two of which belong to the Musè Rodin in Paris and the Saint Louis, Missouri, museum.